Before there was The Da Vinci Code, there was Dan Brown's Angels & Demons. Here, too, the novelist took on the "facts" of Western history – this time "exposing" the secret history of the Vatican, the Illuminati, the suppression of Galileo's most secret manuscripts, and much more. And it, too, left readers wondering what to make of it all. So, with Dan Brown's Angels & Demons atop the bestseller lists, and with their Secrets of the Code an international best seller, the "Secrets" team set out once again to help readers make sense of it all. 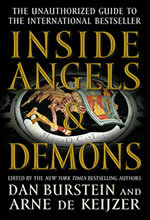 First issued in hardcover as Secrets of Angels & Demons and then as an updated, paperback edition, Inside Angels & Demons, the books present the collective wisdom of more than 40 world class experts who get to the heart of the new interest in the increasingly complex nexus of religion, politics, science, life, death, morality and ethics in our culture. Dan Brown’s thriller Angels & Demons is a fictional murder mystery set against the backdrop of the death of a fictional pope, and the secretive conclave process that has been used for centuries to select a new pope. It also takes on the age-old question of whether religion and science can inform each other or must stay forever as two competing realms. Published three years before The Da Vinci Code, Angels & Demons, is a kind of “prequel” to The Da Vinci Code and includes many of the same themes, issues, symbols, and mysteries from the history of Christianity. Vatican authorities have denounced The Da Vinci Code, with one prominent official, Cardinal Bertone of Genoa, even going so far as to call for banning it. Including Secrets of the Code, there are now over a million “Secrets” books in print worldwide. More than 75 world class experts with widely varying viewpoints—historians, theologians, art experts, scientists, philosophers, linguists, occultists, medievalists, Bible text experts, and other specialists—have contributed articles, interviews, and book chapters to the Secrets Series. For the full list of contributors, click here.